This is my latest cake, and which turned out to be a big hit! 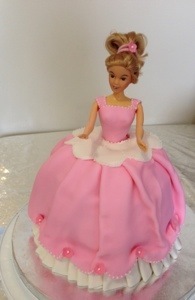 I made it for the birthday of a friend’s daughter who’s been dreaming of a pink cake for her birthday for weeks now. I was excited to make it for her because she’s really one of the sweetest kids I know. At first, I was only planning to use buttercream icing and follow the technique and design in this video . However, when I saw the fondant version of the cake, I realized it looks more professional and sophisticated so I opted for the fondant version last minute, and followed the design in this video. I did more ruffles in the dress than in the video. It wasn’t actually intentional at first and I panicked a bit when I realized the skirt in the video wasn’t as ruffled, but it actually turned out to look pretty good. I tried to decorate a cake, I hadn’t used it since. 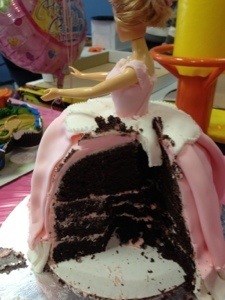 However, with the cake mix extender trick in this blog, cakes turn out tasting great and stand better for decorating. So you save time making the cake and it tastes great. I ended up baking 3 layers of 8 inch cake, and one cake in a round Pyrex bowl. Since I didn’t fill the Pyrex bowl till the end, it’s base wasn’t actually 8 inch to fit perfectly on top of the other layers so I had to trim the other layers a bit with a serrated knife. I think this is described in the video. 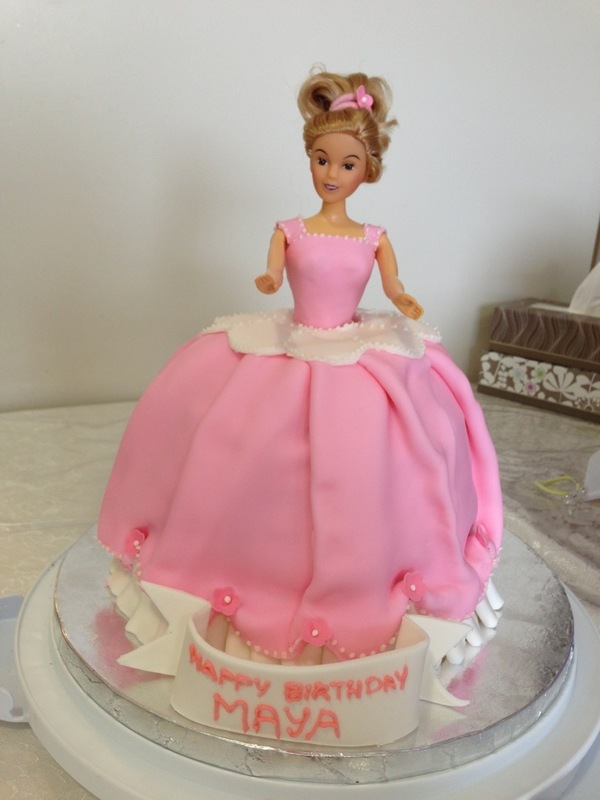 I also used the wilton stick dolls instead of a full Barbie doll, and used a regular hairband to tie her hair and then stuck one of the gumpaste flowers matching the dress’s with piping gel to it. The cake was a big hit in the birthday and it tasted great. My only problem with it is that I couldn’t find a box or caddy big enough to cover it and transport it. It wasn’t really the transportation that worried me as much as I was worried that the fondant would dry out and not taste good. It turned out ok ( not too dry), but I would definitely love to know how to store and transport a tall cake. Any suggestions ?